The tale of Three Kingdoms, as epic and fantastical as it is, strikes me more like a tragedy. Spanning from the decline of the Han dynasty around 168 A.D. to the formation of the Jin dynasty around 280 A.D., the text has multiple major storylines running concurrently, but most of the emotional and developmental energy revolves around the conflict between not only the characters Liu Bei and Cao Cao, but also their ideals and legacy. Their deaths came earlier than I expected in the text, but the struggle between the two's empires continued long after the two's passing. Over the course of the story, a dizzying number of additional characters are introduced. No others receive as much focus as Liu Bei, Cao Cao, Guan Yu, and Zhuge Liang, but numerous others supporting cast members also have their characters explored in depth. An even larger number of names are mentioned in passing for their display of virtue or bravery in combat. Speaking of combat, let's not forget the hundreds of thousands of unnamed soldiers and civilians who fight and die in countless battles, sieges, and sackings. The ground is constantly muddied by blood, and the rivers constantly run red. But all the deaths and killing is not why I would describe the Three Kingdoms a tragedy. It's more because of the sense of futility it conveys. The writing and story elements are abound with repeating patterns, cycles, and foreshadowing. Some are obvious, while others much more subtle, being separated by many chapters, if not volumes. As Cao Cao usurps the Imperial throne for his sons, so does Sima Zhao for his. The repeated excursions Zhuge Liang makes against the North, with increasing resistance from the Emperor of Shu. The Han is undone by eunuchs in the beginning, and so are the Wu and Shu at the end. Perhaps nothing is more telling of these deliberate patterns than the opening line "The empire, long divided, must unite; long united, must divide" being repeated, albeit reversed, in the closing line "The empire, long united, must divided; long divided, must unite." Specifically speaking of the Moss Roberts translation (4th hardcover printing), I found the prose to flow smoothly and found no difficulty casually reading through the story. I did think that it was rife with spelling mistakes, but everything I read online seemed to indicate that this translation was a vast improvement compared to the previously available Brewitt-Taylor translation. The maps printed between chapters were also in black and white, even though I think they were originally sourced in color, making them somewhat difficult to read. Maybe I purchased a Chinese bootleg version of a book printed in China? Is that even possible? Much more important an helpful than the maps, however, were the countless pages of footnotes at the end of every volume. I can't say I read even the majority of them, but the ones I did greatly expanded my understanding of the cultural or historical significance of what was happening in the story. Some even provided the alternate text existing in the 1522 version of the Three Kingdoms novel, whereas the Moss Roberts translation is of the 1660s version. All in all, this is an amazing piece of historical fiction, and unlike anything else I've ever read before. 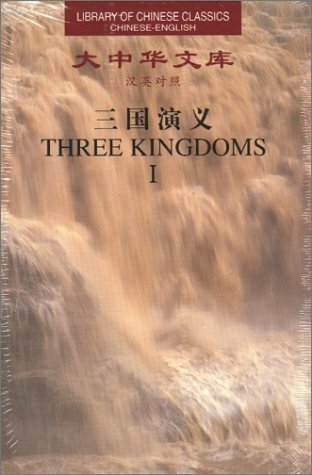 Sign into Goodreads to see if any of your friends have read Three Kingdoms (Library of Chinese Classics.